Trimble TX8 laser scanner combined with RealWorks and SketchUp software brings new capabilities to the architectural field. From its headquarters in Branne, France, Boyé Geometre had long been a leader in architectural surveying. But in 2012, the company’s leaders realized the market was evolving fast. New geospsatial technologies were replacing traditional techniques and processes. Competitors were embracing advanced hardware and software tools. And Boyé Geometre, despite three decades of expertise and a solid reputation, was seeing a negative impact on its bottom line. new approach, one that would feature the three-dimensional content that now plays such a significant role in building design, construction and management. Boyé Geometre purchased a Trimble TX8 laser scanner, Trimble RealWorks software, and SketchUp software. Once the equipment and software were onsite, things got interesting. The Boye’ Geometre team had to learn a new way to work. As was to be expected, there were some bumps in the road. The team understood the field data acquisition and registration processes. But things got a bit challenging when it came time to post-process the point clouds. The lack of experience with 3D led to processing delays. The problem initially prevented Boyé Geometre from achieving the results it wanted. Despite the challenges, the management team was convinced laser scanning should be part of the firm’s workflow. The benefits were obvious; they included reduced time in the field and the ability to quickly capture every detail of a building. The technicians liked what they saw––with laser scanning, they could conduct virtual revisits to the site at any time. Management decided to focus on the deliverables the company knew well; 2D CAD plans, elevations and cross-sections of buildings and infrastructure; while field team members worked to develop the necessary skills to provide 3D products for the BIM market. Already proficient in 2D CAD models built from conventional data, Boyé Geometre technicians quickly developed skills in point cloud registration and in producing orthophotos for the models. Just as the firm’s founder, Guillaume Boyé, had hoped, the Trimble scanning technology soon enabled the company to offer its clients greater detail, improved efficiency, and higher productivity. RealWorks made it easier for Boyé Geometre’s surveyors to manage large amounts of data. Its powerful algorithms eliminated the need for reference targets in the field. And the TX8 team enabled the team to acquire millions of points per second while providing the measurement range needed for every project. The TX8 proved to be extremely reliable, no matter the weather conditions. The company’s technicians also developed the ability to use RealWorks point clouds to generate SketchUp models. From there, they easily extracted classic 2D models or full 3D deliverables. Today, the company’s transition is complete. Boyé Geometre now performs surveys of complex structures such as hospitals and public places in less time and with greater accuracy than ever before. By adding the Trimble hardware and software to their workflow, they have dramatically cut the time it takes to deliver detailed 2D and 3D products. The investment has come with an almost immediate return, not only in financial terms but also in terms of competitive advantage. 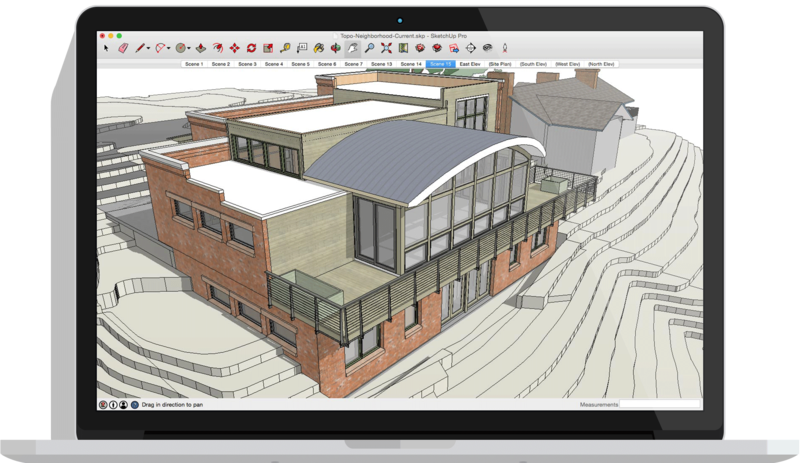 In particular, the integration of the two software packages provided the team with broad new capabilities to create high-value deliverables; its clients are now asking for BIM-quality 3D models. To learn more on Trimble 3D Scanning Solutions click here.